If you're a bus company with an ad campaign that touts the fact nobody's ever heard of "bus rage" and them some freak goes and beheads a dude on the bus, you're quite likely to pull the campaign which is exactly what Greyhound did in light of last weeks bus murder. 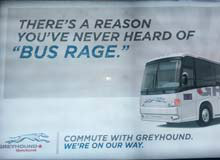 After the murder of 22-year-old Tim McLean, who was repeatedly stabbed and then beheaded on a bus traveling through Manitoba, Greyhound pulled their poster campaign which carried the headline "There's a reason you've never heard of Bus Rage." well, sadly, now there is and the campaign had to be killed. Lenovo, likely the most un-hip computer brand ever, is out with four new commercials which will be aired during the Olympics. The spots, as equally un-hip as the product they tout, are actually quite good...in a decidedly un-hip sort of way. The strangest of all is Troll, in which two guys discuss what happens when their computers crashed. The Lenovo guy just pushes the magical One Button recovery button. The non-Lenovo guy gets a fruit basket delivered by a troll. Strange indeed.